Despite Solyndra's unique technology they were unable to compete cost-wise with conventional solar panels and filed for bankruptcy on Sept. 1, 2011. CIGS. Easy-to-use racking elevates the panel by 11.8 inches. In the 16th century, explorers discovered that the world was round. In the 21st Century, modern day pioneers discovered that a solar panel didn't have to be flat. It could be round. Solyndra solar modules are actually cylindrical in shape. Cylinders one inch in diameter are made up of rolled up thin-film cells [copper indium gallium diselenide (CIGS)] and placed side by side closely together on lightweight racks. Solyndra's Series 100 solar panels span 71.65 x 42.51 inches in size. Their Series 200 solar panels are a bit larger at 89.76 x 42.9 inches. Easy-to-use racking elevates the solar panels about a foot off the ground. See how easy the racking is to install in the video below. 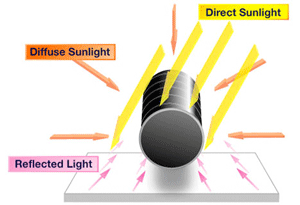 Because the cylinders have a 360-degree photovoltaic surface, they can convert more light--direct, diffuse and reflected sunlight--into electricity. Ideally the roof surface should be white to best capture reflected light. With Solyndra solar panels, light can also be captured earlier and later in the day. With broader shoulders and less of a power peak during the day, a smaller and less expensive inverter can be used. The 360-degree surface also eliminates the need for solar trackers. reflected, diffuse and direct sunlight. Solyndra solar panels are an especially great solution for flat or low-angled roof installations found in many commercial buildings. They are self ballasting, requiring no penetration of the roof surface making it easy and inexpensive to install. The low distributed roof load is less than 3.3 pounds per square foot making it ideal for older or or less sturdy roofs. The benefit of the flow through design is two-fold. Air can naturally flow through and around the panels guaranteeing stability in very high winds up to 130 mph. It also allows the PV material to keep cool, which boosts efficiency and output. Because of the unique design, light snow falls through the Solyndra panels and the panels actually benefit from the increased albedo (reflected light) from a fresh snowfall. Solyndra systems experience less system loss due to snow. To find out if Solyndra's unique solar panels are appropriate for your application, please call us at (1-800-472-1142 or email us at [email protected] .